Little Annie Oakley was beer soaked, underweight and riddled with fleas when a Good Samaritan rescued her from a dumpster. Now the kitten is beginning a good new life in foster care. Trash vs. Treasure… a kitten thrown out with the trash! For Portage APL, the increase in injured and emergency cases continues. A report came in on Labor Day of a kitten found in a dumpster, inside a closed trash bag, with empty cans of beer. 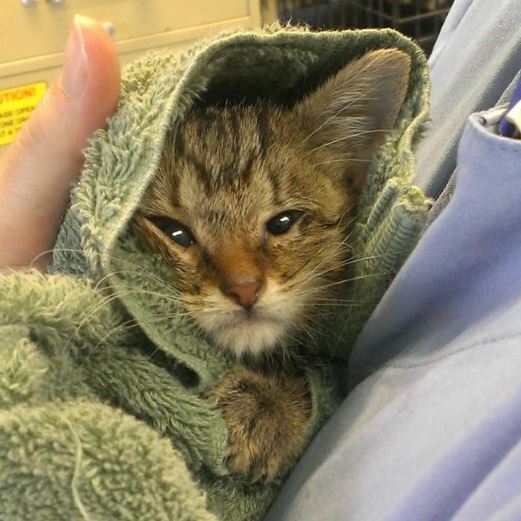 A woman heard a kitten crying from inside the dumpster. She pulled out the bag and opened it. Inside she found a tiny kitten. The kitten was covered in beer, fleas and very weak. Once Portage APL took the kitten back to the shelter for evaluation, the need became clearer. This little female kitten, had a head tilt (maybe a neurological problem or abuse), fleas, tapeworms, she was emaciated and dehydrated and in general poor health. A trip to the veterinarian was scheduled immediately. The exam showed that she was actually about eight weeks old. This was a surprise given her size. Initially she was thought to be much younger. But malnutrition and fleas probably hindered her growth. She was given fluids, flea medication, a de-worming medication, a bath, food and lots of love. We are not sure why someone would have thrown her out like garbage. But we are so thankful someone heard her cries. Her hours inside that bag were numbered. Portage APL relies on the community to step up and help. The kitten, named Annie Oakley is in foster care gaining weight and recovering from her ordeal. Annie should be available in the coming weeks if all goes well. Follow up visits to the veterinarian will also be in her future to determine if her head tilt is permanent or temporary. To make a donation or for more information, please call the Portage Animal Protective League at 330.296.4022, follow them on Facebook or visit the donation page at their website.